Beginning with a long history of farming through previous generations, Niemeyer Family Farms strives to operate a profitable and respectable family farming operation in an ever-changing business world. Steve and Tim’s grandfather, Frank Niemeyer, part of a multi-generation farm family, ventured into the agribusiness world in the 1940’s by starting both an equipment company and a fertilizer plant. This vertical integration, as it is known today, was well ahead of its time. Over the course of the next 20 years, Frank and three of his sons ran both the businesses as well as a large farming operation. Upon Frank’s death in 1969, the three sons separated the operations. Two sons, Victor and Fred went into farming for themselves along with their new families. Tim was born to Victor in 1965 and Steve to Fred in 1966. They grew up together nearly as brothers as the farms and families were so closely knit. In 1975 Tim’s father Victor passed away, leaving Tim and an older brother to run a livestock and grain operation. Both the brothers’ operation and Fred’s operation struggled due to the hard times in the 1980’s. After high school, Tim began his own farm and worked part-time for his uncle Bob who ran a machinery dealership. Tim continued farming on his own and was named Outstanding Young Farmer of Missouri in 1995. Tim and Monica married in 1992; they have 2 children: Kaitlyn, and Ethan. Steve graduated from the University of Missouri in 1988; he then spent five years working in the grain industry. In 1994, Steve returned home and in 1997 married Leslie Patterson. Steve and Leslie have two children, Rachael and Cole. In 1994, S & T Farms was formed with 500 acres of rented land. Each year the farm grew and, in 2002, made a substantial increase to 8,000 acres. Growth has continued through the years and surpassed 10,000 acres in 2009. 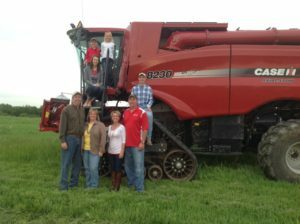 In 2010, Niemeyer Family Farms was formed upon joining FamilyFarms Group. A bright future is ahead for Niemeyer Family Farms and the next generation of Niemeyers.